Oahkam Home Improvements also specialise in supplying and fitting quality kitchens. After an initial discussion of your requirements, we will supply you with 3D CAD images of your new room with full specification lists. Tiles, tiling, specialist carpentry, paint effects and colour schemes are all included in our package. You will be able to discuss anything you can think of with our in-house designers, and as with all of our quotation services, it is free. 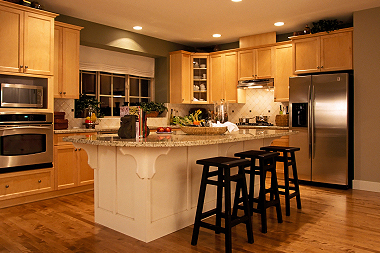 Oakham Home Improvements are kitchen specialists in Rutland, Leicester, Leicestershire and the surrounding counties.